All those who have been eagerly waiting for an amazing, value oriented 50’’ 4K LED TV will probably be very pleased with this model from Vizio. The M-series boasts 32 active zones of backlighting in comparison to the 64 on the P-series Vizio. Also, the Clear Action rate is reduced from 960 on the P-series to 360 on this model. 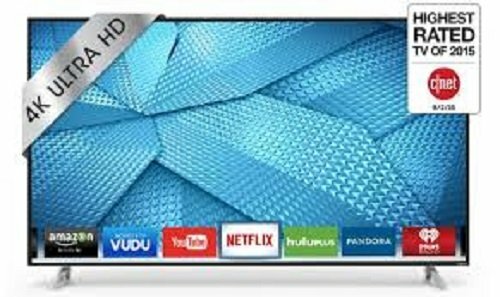 However, there have been some great technological improvements in this TV since Vizio has had enough time to work in the UHD space, particularly in the very important upscaling area. Their new spacial scaling engine is really enhanced for this year. Pricing seems to be a gamechanger for 2017 as well. This TV’s beautiful Ultra HD picture quality allows you to relax in your home theater space or your living room making everything you watch on it look crystal clear. Furthermore, you’re able to easily discover your favorite TV shows and movies with a vast array of 4K content and popular apps at your fingerprints. We mustn’t forget to mention the fact that VIZIO M50-C1 is ideal for gaming, thanks to its amazing Game Mode setting. The stand feet on this model sit 3 feet apart and are nice brushed dark silver. Whichever size version you purchase, take into consideration the stand feet’s width if you plan to place it on a table. Just make sure it is wide enough to accommodate. The design of this TV is really nice looking with a black bezel frame and rounded edges. Sides, bottom, top, and the very outer edge are encased in nice brushed dark silver. This is a very refined and nice appearance. The quality and the balance of the speakers on this TV are really impressive. Volume from this speakers (2 x 10W) is really loud, even at just 40% volume level. If you watch your favorite BluRay movies on this TV, the speakers will do an amazing job with voice quality and clarity. There is more than enough volume even for a really large room. Overall, this is definitely one of the best audio/speaker sets on the market. There are several great options regarding the picture setting modes on this TV. It is set to the Vivid setting when you purchase it. This setting boasts a significant blue push since the Color Temperature is adjusted to Cool. The Contrast is 50%, Sharpness 60, Backlight 90, and Auto Brightness control is disabled. There are also Computer setting, Standard setting, Calibrated Dark setting, but the most interesting ones are Calibrated and Game Mode setting. With Calibrated you’ll get natural, nice worm colors. Backlight is 85, color 50, contrast 50, and sharpness 30. Finally, Game Mode on this TV is really amazing (Gamma 2.2 and Low Latency setting is On, Active LED Zones are Off, Clear Action setting is On, the Reduce Motion Blur and Reduce Judder settings are set half way 50%). This combination of the VIZIO M50-C1’s features enhances response rate for gaming. The Game Low Latency setting helps reduce input lag regardless of which Picture Mode you are using. This model’s Game Mode boasts incredibly low input lag so we highly recommend this TV as a gaming TV.